In September 2012, Legend Numismatics of Lincroft, New Jersey has announced that collector Bob R. Simpson, co-chairman of the Texas Rangers baseball club, paid $1 million for the finest known 1943-S Lincoln Wheat cent on a bronze planchet. All 1943 Lincoln cents were supposed to be made of steel planchets coated with zinc. However, some bronze planchets left over from 1942 slipped into the production process. These error coins are extremely rare and highly sought after by error coin collectors. According to a press release, it was successfully acquired by Legend after "determined negotiations" with an East Coast dealer representing the seller who is described only as "a long-time collector," according to Legend President Laura Sperber. "Mr. Simpson said, 'It's a beautiful coin.' As he held it he reminisced about the 1943 'copper' Lincoln cent he found in change when he was a youngster, but that turned out to be a fake," said Sperber. The MS62 coin is the finest of four known 1943-S bronze cents, and it is an upgrade to an example graded PCGS AU58 that was in Simpson's registry set. What Is an off Metal Error? When the United States Mint manufactures coins, they are produced within tight tolerances as defined by law. Specifications in the law include diameter, thickness, metal composition and design requirements. When a law dictates a change to the coinage, the Mint must adjust its production process to accommodate the requirements of the new law. In this instance, the United States Congress passed a law that specified pennies produced in 1943 are made out of steel instead of bronze. How did this Error Coin Happen? Each production facilities of the United States Mint is a factory that produces coins for the United States of America. Much activity goes on in these facilities that enable them to produce billions of coins every year. While they pay close attention to the process to achieve world-class quality, some mistakes do happen. In this instance, coin experts believe that planchets from the previous year (1942) which were made of bronze were still lingering in the production process. Although it cannot be proven, another explanation for this error coin is that a mint employee purposefully struck a few 1943 pennies on bronze planchets. Although illegal, sometimes these do escape the security procedures of the Mint. Since Lincoln cents are one of the most collected United States coins, demand for them is extensive. 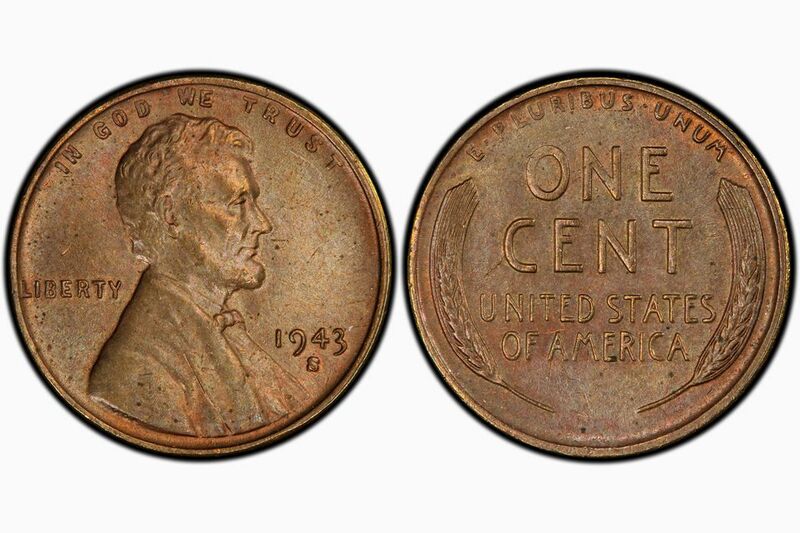 Given the unusual look of a 1943 steel Lincoln cent, a 1943 Lincoln cent made out of bronze is one of the "Holy Grail" of Lincoln error collectors. Compounding the pressure of a highly collectible coin with the fact that there are only five known examples of a 1943-S Lincoln cent made in bronze, the price will skyrocket! 1943 Copper Penny - Is Yours Genuine or Fake? Can You Guess How Much a 1943 Penny Is Worth? Is Your 1943 Copper Penny Real or Fake? Is a 1943 Silver Penny Rare? Why Doesn't my Lincoln Penny Have a Mint Mark?